Only a french man could make a statement so loudly and proudly. 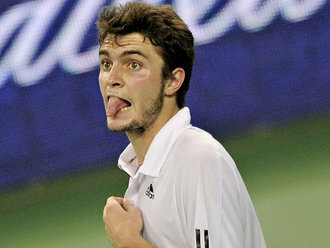 Congratulations to Gilles Simon and his newly found power within the ATP Player Council – oops? What’s that? No power actually comes with the job? Oh well, at least he’s getting paid well. Tiriac down in second set…. Maybe Orange Tennis Balls will stick? The controversial blue clay surface used for the first time at the Madrid Open last month will be banished next year, the governing body of men’s tennis said on Saturday. World numbers one and two, Novak Djokovic and Rafa Nadal, led the complaints against the new surface, saying it was too slippery. “After careful consideration I have decided blue clay courts will not be allowed next year,” ATP executive chairman and president Brad Drewett said in a statement. “I very much believe in innovation and exploring ways to enhance our sport. “While the blue clay may have offered better visibility on television, there were clearly issues with the quality of the courts in Madrid this year which were not acceptable at an ATP World Tour Masters 1000 tournament,” Drewett added. “Regardless of colour we must first ensure that courts are safe and fair for players.” Drewett was keen to stress, however, that he did not want to put a break on new ideas. “(Madrid tournament owner) Ion Tiriac has been a great supporter of the game for many years and I continue to encourage his ideas including the testing of blue clay at non-ATP World Tour events,” he added. I am loving this blog of recent: http://grandslamgal.com/the-grand-slam-plan and will be adding to my blogroll menu. Check out Grand Slam Gal and Ball Boy’s updates from their Grand Slam Plan tour! I came across this article yesterday in the International Business Times. The business of tennis has become grueling and I found this article to be eye opening! Check it out and voice your opinion. Normally the figures that sportsmen earn these days for their craft offend my left leaning sensibilities, but I make an exception for the hard working superstars of tennis. I begrudge Andy Murray not a dollar for his $20,376,752 career earnings, though this might in part be because his lifestyle isn’t ostentatious or obnoxiously decadent, unlike the stars of other professional sports. Tennis is played for nearly 11 months of the year, with a genuine off season of just 6 weeks, three of which are spent in conditioning training preparing for the start of the new season. It is one of the few truly global sports in terms of its calendar. Formula One may be the only sport that can claim to hold more premier events in wider flung destinations. But tennis is now suffering from a sort of imperial overstretch – there are simply not enough weeks in the year to satisfy the global demand for top class tournaments. As stands, a players ranking is currently made up of their best results in a 365 span from Four Slams, Nine Masters 1000 events, the end of year ATP Tour Finals and their best other Four results in ATP 250 and ATP 500 events. This is a serious commitment, when you break it down. There are three major problems with the timings of the slams. 1. The Australian Open comes just two weeks into the new season to coincide both with Australia day and the school holidays. Unfortunately, there are only very minor ATP 250 tournament events before it, and the players are not at peak fitness. It feels very odd that one of the four major tournaments is decided before the season has really got into full swing. 2. Roland Garros comes on the back of a punishingly long clay court season, but there is only a two week gap between the final of the French Open and the start of Wimbledon. This means that the grass court season lasts only a month in total, and the three major warm up tournaments – held in Halle, Queens Club, and ‘s-Hertogenbosch, are all merely ATP 250 events. There is no Grass Court Masters event, and no Grass Court ATP 500 event. This is a wholly inadequate build up to Wimbledon, a devaluing of one of the surfaces and doesn’t let players adapt to the different court conditions adequately. To put this in context, the Gerry Weber Open in Halle kicks off on Monday the 11th, and Rafael Nadal is supposed to be taking part, but his French Open final has been suspended until Monday after a rain delay. Novak Djokovic has decided to forgo entering a grass court warm up event this year. Roger Federer and Andy Murray have had a comparatively decadent four days off between their clay exits and the start of their grass campaigns. 3. The US Open finishes in September, and the season still continues for another two months. This is a massive anti-climax, as the ATP Tour Finals simply do not hold the same prestige as a slam. Frequently top players have pulled out of the event to protect their broken bodies from further injury at the end of an 11-month season so they can rest up and be fit to do it all again in January. Monte Carlo is still worth 1000 points and considered a ‘Masters’ event but has been designated as optional, rather than mandatory participation. In addition to this, Hamburg was recently downgraded from a Masters 1000 event to an ATP 500 event, much to the chagrin of the tournament organisers. This is simply too much tennis. The players are normally so exhausted by the end of the year that they either are unable to compete to the best of their ability, or they withdraw. The Shanghai Masters in October 2011 was a case in point, Roger Federer and Novak Djokovic citing fatigue and lingering injuries as a reason for withdrawal. Rafael Nadal pulled out of the Paris Masters the following month as it didn’t fit his training schedule for the ATP Tour Finals, which started the following week. Players are often under heavy pressure from sponsors or home countries to play in minor tournaments. Many tennis journalists for example, felt that Andy Murray should pull out of Roland Garros when his back started hurting so he would be fit for Queens. Novak Djokovic was instrumental in bringing a tournament to Serbia, so he must play in it. The US Open runs its own complicated run of tournaments known as the ‘US Open Series’ with cumulative bonus prize money for those who participate and advance in multiple events. Davis Cup tennis is interspersed through the year, often at majorly inconvenient dates. On top of this, mindful of high withdrawal rates in recent years and wanting to protect the integrity of the tour (and appease the far eastern market) the ATP insist on players playing a certain number of tournaments played after the US Open to ensure participation. Tennis is a strenuous sport where injuries are frequent and unforgiving. Juan Martin Del Potro won the US Open in 2009, but has since been sidelined with tendonitis in the wrist. Andy Murray has been suffering back spasms that plagued him during the course of the clay court season, and long term has to manage the chronic pain from a bipartite kneecap. Rafael Nadal’s knees were so badly damaged in 2009 there was a fear that he might never be the same player again, and unfortunately it feels that it’s going to take a loss as big as that to teach the ATP that the biggest asset in the sport of tennis is the players themselves, and if they are continually mandated to commit to such a gruelling and never ending touring schedule, their bodies may collapse under the strain. There is an easy solution to remedy this problem: tournaments should be rotated, in the way that the Canadian Masters rotates year-by-year between Toronto and Montreal. Indian Wells & Miami should be combined and rotated as an early hard court Masters event. Monte Carlo & Madrid should be combined and rotated, followed by the rotation of Rome & a returning Hamburg to make two Clay Court masters events in the build-up to Roland Garros. This would also allow Roland Garros to be moved back two weeks, and allow room for the rotation of a Grass Court masters between Halle and Queens with adequate recovery time before Wimbledon. The Canadian Masters and Cincinnati are good preparation for the US Open and can exist as they currently do. The Paris Masters should be cancelled, not least as Paris already has a Slam, but because the tournament leaves no time before the ATP world tour finals which leads to withdrawals and injuries. This would reduce the number of Masters tournaments from nine to six, while at the same time adding a grass court Masters. The ATP Tour Finals should be resituated in Shanghai and moved back to mid-October as this would increase the length of the off season and give the players a chance to heal. It would also ensure that the Shanghai event also acts as a finale to the Asian swing of the calendar as there are many ATP 250 and ATP 500 events in the Far East in the preceding month. We are privileged to witness the golden era of tennis, but we cannot take the players well-being and durability for granted. There is also an argument to be made that less is more. In general, casual tennis fans are unaware of the intricacies of the ranking system and schedule beyond understanding the primary importance of the four Slams. Oversaturation of a successful product can be a hindrance, particularly if this oversaturation is to the detriment of the players that make the game such a joy to watch in the first place. Spoiler Alert! Stosur/Errani Match Scores just in! Sam Stosur is ousted by the #23 WTA ranked Italian! Sara is on fire making it to the Roland Garros Finals in both singles and women’s doubles! I might have a new favorite! The petite Errani (5’5″) will face either Sharapova or Kvitova on Saturday.